Shell enclosure with quality tongue and groove construction. Assembled with 4 self-tapping screws. PCB mounting vertical or horizontal. Bosses located on top and bottom of enclosure. 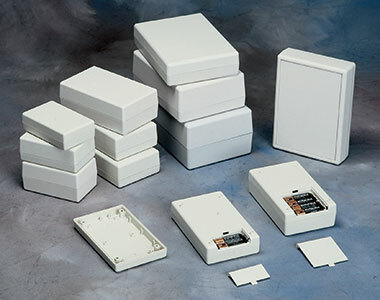 Recessed area on select sizes allow for easy installation of membrane keypads. 4.49 x 2.83 x 1.30"
4.0 x 2.5 x 0.04"
4.49 × 2.83 × 1.32"
4.49 x 2.83 x 1.77"
4.49 x 2.83 x 2.24"
5.7 x 3.2 x 0.04"
6.22 × 3.74 × 1.77"
6.22 × 3.74 × 2.24"
7.48 × 5.43 × 1.77"
6.77 x 4.72 x 0.04"
0.39 x 0.06 x 0.0"
0.39 x 0.12 x 0.00"
0.37 x 0.17 x 0.0"
0.25 x 0.30 x 0.01"
0.25 x 0.4 x 0.15"